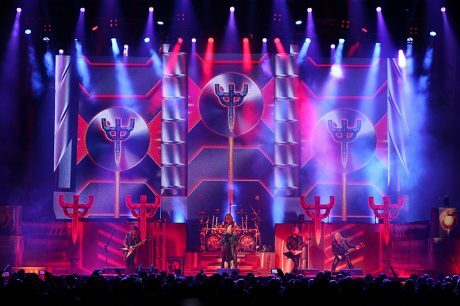 Judas Priest, the U.K.-based heavy metal artists, have been around for almost 50 years now. With their new album, Firepower — their 18th — released in March to widespread acclaim, this band, which has sold more than 50 million copies of their albums to date, shows no signs of slowing down. 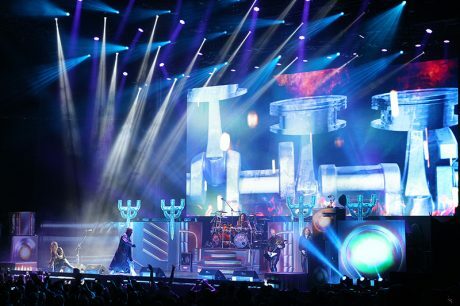 According to lighting designer Tom Horton, the band is looking forward to many more live shows, and judging from their latest, there is no lack of energy on stage or a farewell tour in sight. Horton, out of Seattle, has been behind the lighting desk with this act for 14 years; he started up with the band not long after lead vocalist Rob Halford rejoined in mid-2003. We caught up with Tom for the first time since he was out with Green Day last year. The 2018 tour is taking the band through North American venues from March through May 1, before a May 5 show in Mexico City. The European leg runs from June 5 through August 10, then the band swings back through North America from Aug. 21 through Sept. 30. The band covers the gamut of venues on this run, so the rig called for versatility. “Last night we were in a theater in Milwaukee, tomorrow we are in an arena. I needed a rig that could be versatile, yet still look big when we play arenas.” The band is filling them as well. The trusses are filled with well-known fixtures that the LD can easily source anywhere in the world. They are evenly stocked with GLP X4 pancake style wash lights, MAC Viper AirFX for spots, Sharpys for beams and good old-fashioned Atomic strobes with color changers. “There’s still something I like about Xenon strobes. That sizzle you get. While they can’t stay on, they dim better than many of the LED models. The color changers came out well prepped, like all the gear; there have been minimal issues if any. CT (Colonel Tom) Touring provided the video elements, which includes a massive 48-by-24-foot (WxH) LED wall above the set, erected from Flyer 12mm made by Kindwin. At times this is cut down to a 32-by-16-fooot (WxH) LED video display to fit in the smaller venues. “Mark Devlin did a great job supplying us with custom content. We’ve had a long history with clever album art and a lot of that is manipulated and applied here as well.” The content is all played back from a Catalyst media server run off Horton’s grandMA2 console. The set was provided by Hangman and Metalman, a premier set and drop company out of the U.K. This included a downstage kabuki reveal that starts the show. The fabric artwork consists of Judas Priest’s trident symbol (affectionately known as the pitchfork to Horton), surrounded by song lyrics in an eerie font. Horton illuminates this with mostly with MAC Vipers from the front truss, while the bottom gets help from a ground row of Chroma-Q Color Force 2 striplight fixtures along the downstage edge. The drop is released on cue via solenoids and gets sucked straight upstage center by a sniffer device provided by Metalman. The band gear rides in carts that are hidden behind soft goods, providing a clean stage. The soft goods have patterns on them and are kept illuminated by the same ground row downstage. Pipe and drape with more fabric encloses the stage and hides the backline crew from sight. New this year are three 15-foot-wide Wahlberg roll drops that the band purchased. They are used during the first three songs before winding up for Horton to reveal the video wall. “As far as lighting goes, the songs are usually fast and hard. They call for aggressive colors. Hence red, yellow and white — fiery tones of color are used often.” That’s not to say that other colors weren’t evident in the performance, but I will mention that the use of magenta and pastel colors was sparse. Mark Devlin designed the media content. The band had a setback when lead guitarist Glenn Tipton announced he was stepping back from performing after being diagnosed with Parkinson’s disease. 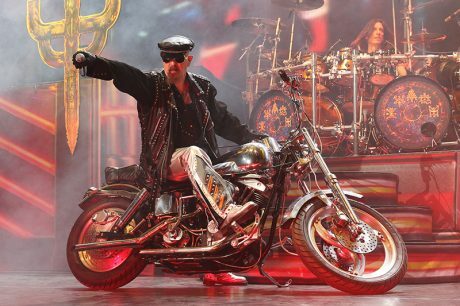 The band has a substitute player and continues to rock, with the obligatory motorcycle still bringing vocalist Rob Halford on stage. A summer shed tour with Deep Purple is on the horizon, with more dates rumored through next February.